SteelSeries has announced a new version of its Rival gaming mouse, claiming that the Rival 100 has "40% higher tracking accuracy and movement-tracking speeds up to 33% faster than top competitive mice." Which mice? Who can say! But we can say that the Rival 100 is available now on the SteelSeries website for $40. The Rival 100 uses a custom Pixart S3059-SS optical sensor with 8 CPI steps up to 4,000, support for speeds up to 143 IPS, and 20g acceleration. 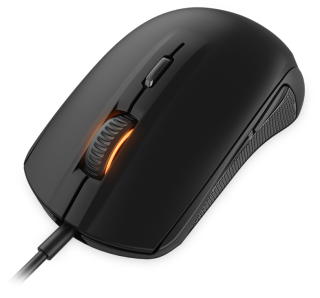 SteelSeries says that this is “the most accurate 1:1 optical tracking experience for any mouse under $50.” It also boasts a low lift-off distance that Steelseries says won't sacrifice sensor performance. You’re able to customize and remap all six of the buttons on the mouse, adjust the sensor’s CPI, change the RGB illumination, and create custom configurations for each of your games. You’re also able to change the illumination settings to reflect in-game actions. As for changes from the original Rival 300, it’s cheaper for a start. The Rival 300 costs $70, but it does have a sensor adjustable from 50 to 6,500 CPI. That doesn't mean the Rival 300's sensor was more accurate, of course. It also has two independent lighting zones for you to customize, as well as the ability to swap in your own 3D printed nameplate. In addition, the Rival 100 is only available in black, while the Rival 300 is available in black, white, and silver (although the latter is currently out of stock).